The garden, which was built and planted June 11, is located at the Summerseat historic house. Fifteen Sabra Dipping Co. employees joined VSU faculty and staff in the effort, a press release states. The project is a joint effort of VSU’s Sustainable and Urban Agriculture Cooperative Extension program and Sabra’s “Plants with a Purpose” program. The urban garden project is designed to transform the 2.2-acre historic land parcel known as Summerseat into a food and agricultural hub to address food security issues within local schools and communities, enhance nutrition and food education, and bring people together. Summerseat is located at the corner of Chesterfield Avenue and River Road, across from Ettrick Elementary School and next to VSU’s Multipurpose Center. The volunteers, some of whom were members of the Ettrick community, constructed 10 raised bed gardens, including shorter ones that will be accessible to children and those in wheelchairs or waist-high beds. The beds will hold a variety of crops throughout the growing season. The purpose of the raised-bed gardens is twofold: to teach members of the community how to successfully grow their own healthy food and to harvest the crops for donation to food distribution centers in and around Ettrick. Later phases of the Summerseat Urban Garden Project may include a certified kitchen, nutrition and cooking classes, a historical museum in the Summerseat building and K-12 educational programs. Four years after publishing the groundbreaking study “Food Deserts in Virginia,” VSU continues to identify ways to raise awareness of the state’s food security issues and to provide fresh, affordable food to all residents. Sabra Dipping Co. shares a similar commitment and believes that everyone should have ready and affordable access to fresh fruit and vegetables. Both entities are confident they will be able to create a recreational, historical and productive green space at Summerseat that will provide maximum benefits to the public. Sabra is also providing tuition assistance for students of VSU’s Sustainable Urban Agriculture Certification Course, which aims to increase competence and marketability for a career in urban agriculture. 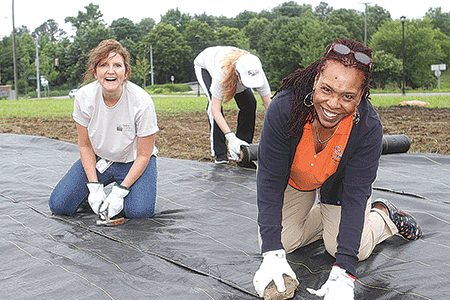 Students will have an opportunity to apply their skills in Sabra’s 340-square-foot employee workshare garden on Sabra’s South Chesterfield campus.